Mont Saint Michel  (often written Mont St Michel, with other variations) is a small UNESCO World Heritage site located on an island just off the coast of the region of Lower Normandy in northern France. The island is best known as the site of the spectacular and well-preserved Norman Benedictine Abbey of St Michel at the peak of the rocky island, surrounded by the winding streets and convoluted architecture of the medieval town. Mont Saint Michel was officially inscribed as a World Heritage Site in 1979. It was ransacked by the Franks, thus ending the trans-channel culture that had stood since the departure of the Romans in AD 460. 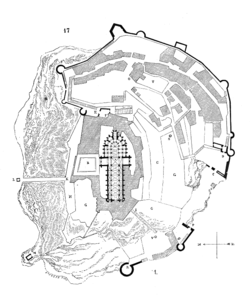 Before the construction of the first monastic establishment in the 8th century, the island was called "mons tumba". According to legend, the Archangel Michael appeared to St. Aubert, bishop of Avranches, in 708 and instructed him to build a church on the rocky islet. Aubert repeatedly ignored the angel's instruction, until Michael burned a hole in the bishop's skull with his finger. The saint's skull, with hole, can be seen in St Gervais churche in Avranches. The mount gained strategic significance in 933 when William "Long Sword", William I, Duke of Normandy, annexed the Cotentin Peninsula, definitively placing the mount in Normandy. It appears on the Bayeux Tapestry which depicts the 1066 Norman conquest of England: Harold saves Norman knights from the quicksands in the tidal flats during a battle with Conan II, Duke of Brittany. Norman Ducal then French royal patronage financed the spectacular Norman architecture of the abbey in subsequent centuries. In 1065, the monastery of Mont-Saint-Michel gave its support to duke William of Normandy in his claim to the throne of England. It was rewarded with properties and grounds on the English side of the Channel, including a small island located to the west of Cornwall, which was modeled after the Mount, and became a Norman priory named St Michael's Mount of Penzance. During the Hundred Years' War, the English made repeated assaults on the island, but were unable to seize it due to the abbey's improved fortifications. Les Michelettes – two wrought-iron bombards left by the English in their failed 1423–24 siege of Mont-Saint-Michel – are still displayed near the outer defense wall. When Louis XI of France founded the Order of Saint Michael in 1469, he intended that the abbey church of Mont Saint-Michel be the chapel for the Order, but because of its great distance from Paris, his intention could never be realized. WARNING: Attempting to reach Mont Saint-Michel by any other route than the footbridge can be dangerous. It is not unheard of for tourists to drown after being cut off by the tide, and the deep mud and quicksand surrounding the island can be treacherous. If you do decide to attempt the crossing, take an experienced guide and check the tide tables. In addition, do not attempt the crossing when the barrage on the Couesnon River is discharging water. Driving is probably the cheapest and easiest way of visiting Mont Saint Michel, although the queues for entry to the car-park are often very long and car-parking charges are steep. The Mont Saint Michel is a short drive from the A84 Caen-Rennes motorway. Within the region of Normandy, drive from Caen along the A84 south-west past Avranches to the exit for Pontorson. From Brittany and Rennes, the exit is just before Avranches. Then follow the signs to Mont-St-Michel for about 20 kilometres. The car-parks are huge and never fill up, but are a long way (over a mile) from the Mont itself and a free shuttle is available. Please make sure you pay at the ticket machines before returning to your car. The ticket machines are located at the rear of the information centre where the shuttle buses depart from. From Paris the total driving time is about 4 hours. There are no direct train services between Paris and Mont St Michel, but it is possible to travel to Pontorson by train and then complete the last leg of the journey by bus. The best option is the TGV from Gare Montparnasse to Rennes, where a bus run by "Keolis Emeraude (ex Courriers Bretons)"(tel. 02-99-19-70-70, http://www.destination-montstmichel.com;) provides a 90 minute transfer to the island (there are 4 departures from Rennes per day, most departures are timed to match to the arrival of the TGV in Rennes but it is always better to check the timing for last minute changes). The bus station is immediately outside the Rennes train station, at a bus terminal building on your right, after leaving the station by the north exit. The bus costs €15 one-way, with a 25% reduction for people under 25 or older than 60, and it's free for children under 12. Bus tickets are sold by the driver when boarding the bus, and in advance at the bus terminal. On off-season Sundays, the Rennes connection is often unavailable; take the TGV to Dol-de-Bretagne (listed by RailEurope as Dol, France), then the Keolis bus to Mont Saint Michel, which costs €6.60 (Oct 13) for adults, 25% off for under-25 or over-60, free for children under 12. Note that the bus stops at the Mont St Michel tourist information center, from which it's a 45-minute walk or 10-minute ride with the free shuttle to Mont Saint Michel itself. You can also ask the driver if you want to stop to the hostel before Mont St Michel. The trip into Mont Saint Michel in the morning can be jammed up with traffic. Similarly, expect to be in a traffic jam on the way out as there is only one road leading into and out of the site. During summer, the jam can be up to an hour or more when there are lots of visitors. This meant that you may run a risk of missing your return train to Gare Montparnasse if you are on a day trip from Paris. There is a good chance that the train might wait for the returning bus from Mont Saint Michel in the afternoon if the timing is slightly off. Another option is to take a TGV train to the Pontorson-Mont St Michel train station (up to 4 a day), with a stopover in Rennes. The Pontorson train station is no more than 15 minutes from Mont St. Michel. (It is nearly 10km so this estimate of time is not for walking.) Buses are available several times a day. You can get a schedule from the Pontorson train station. Parking for bicycles is free, and the ride from Pontorson to the Mount is not particularly difficult. The only way around Mont St Michel is on foot, and there are two gates into the walled city. The Porte de l'Avancée, the main gate at the end of the causeway, leads straight to the Grande Rue, which is packed chock-a-block with souvenir shops and tourists. Escape right up the stairs to the ramparts, which are a little less packed and offer great views of the mudflats. The lesser-used Porte Eschaugette, to the left of the main gate, is the quietest route up. All three routes converge at the Abbey on top of the island. Abbey of Mont Saint Michel (L'Abbaye du Mont-Saint-Michel) , open 2 May - 30 August 9am-7pm (last admission 6pm), 1 September - 30 April 9:30am-6pm (last admission 5pm), admission (unguided visits): €9 adult, €5 18-25 yrs (free for citizens of the EU), and free for visitors under 18. Closed 1 January, 1 May and 25 December. €4 audio guide (French, English, German, Spanish, Italian). Once a humble little monastery, the island and its fortifications have effectively grown up around this. During the French Revolution, the abbey was used as a prison, and an extensive restoration was required to restore it. A few prison-era showpieces, like the human hamster wheel used to lift supplies in and out of the complex, have been kept. Mass is celebrated daily at 12.15PM, except Mondays. The Carolingian church named Chapelle Notre-Dame-sous-Terre (Our Lady underground) was built around 966 by the first Benedictine monks at the very place of the oratory erected by Saint-Aubert in the early VIIIth century. Various creperies line the streets leading to the Mont Saint Michel. The culinary specialty of Mont Saint Michel are Omelettes, whipped until frothy and light, and saltmarsh lamb (agneau de Pré Salé) dishes from the sheep that wander around the coast. None of the eateries on the island are particularly good (and they are all vastly overpriced) so if you are planning on staying on the Mont itself be aware that you might prefer eating in a town in the surrounding countryside. The old town at the base of the abbey hosts a wide selection of restaurants, cafés, fast food outlets and other food venues. Note that Mont Saint Michel is more than slightly a tourist trap with regard to refreshments and travellers' needs - check a number of places for the best deal before ordering. Even then, do not rely on good service. Du Guesclin, on the ramparts with good views out to the sea, . The menu touristique, including oysters, omelets and lamb, starts from €20.90 (in 2018 ), which seems positively cheap by Mont St Michel standards. La Mere Poulard, right at the entrance. World famous for their omelette. They put non-traditional ingredients into it and cook it right in front of the window of the restaurant. Be careful to make reservations ahead of time because it is usually crowded. Also they only sell their world famous omelette at certain times of the day, so when you make reservations, be sure to make them for the right time if you're intending to get an omelette. Expect to pay more than €30 for the privilege! On the approach road to the Mont is a small area of shops, restaurants and supermarkets, although not cheap, they are more reasonably priced than getting food on the island. There is also (limited) car parking there. There are many popular drinking spots on this famous island. 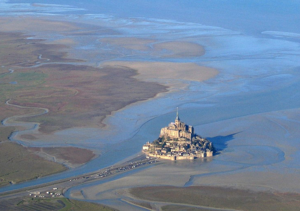 Mont Saint Michel has a number of small hotels located within the island township. A selection of much larger hotels are available on the mainland opposite the island and in the nearby town of Pontorson, but many visitors choose to daytrip from Rennes or Saint-Malo instead as the island can be comfortably covered in a few hours. The car park allows motor homes to stay overnight as part of their standard parking fee. Chateau de l'Isle-Marie (Permanently Closed), Isle-Marie 50360 Picauville, http://www.islemarie.com/ ☎ 0233213725, . Luxury chateau B&B near Mont Saint Michel recommended by Travel & Leisure and the Michelin Guide, a unique experience in Normandy. E-mail : [email protected] . Tel. : 0233681159. Fax: 0233589536. Due to the tourist nature of the Mont it can get very busy, especially in high summer. Because of the steep steps up to the Abbey, people can sometimes feel unwell, and may want to rest in the numerous gardens throughout the Mont with plenty of seats. Keep walking when others are behind you as causing a blockage is likely to annoy them. In July and August 2012, the Abbey is open until midnight with last admittance at 11:00 p.m. A great time to visit as the crowd has really thinned down in the evening. The local Office de Tourisme is located in the Corps de Garde des Bourgeois (the Old Guard Room of the Bourgeois), at the left of the town gates (tel 02-33-60-14-30). Open daily all year except for Dec. 25th and Jan 1st. The tidal mudflats surrounding the island contain areas of deep mud and quicksand. Visitors to the island are advised not to attempt crossing the flats by foot. However, if you decide to attempt the crossing, be prepared to take off your shoes and clean up your feet afterwards, as the flats are extremely muddy. The tide here is one of the fastest-rising in Europe, and as such you should never attempt any walks on the sands without checking the tide tables. It is also advisable to only attempt the crossing with a qualified guide. The Mount has several steep staircases, sheer drops, and uneven ground. Keep your children under close watch and ensure that you pay due attention at all times. This page was last edited on 6 June 2018, at 01:01.